For the past two days — and really, for the past couple of weeks, if not longer — the Yankees have been playing a bizarre sort of baseball where losing hardly had any consequences. The Yankees dropped 17 of their final 26 games, and yet still could have won the division on the season's final day. And if they didn't win the division, if such a thing really didn't matter to them — and at times, Joe Girardi certainly managed like it didn't — the realistic worst-case scenario meant not having to face Cliff Lee in the five-game ALDS. And so, after two final losses in Boston — in an odd series that included three games in roughly 24 hours — the Yankees are the 2010 wild-card "winners," and they'll open the playoffs on Wednesday night in Minnesota. The Twins have already announced a four-man rotation for that series — Francisco Liriano, Carl Pavano, Brian Duensing, and Nick Blackburn — but Joe Girardi has so far only announced that CC Sabathia will start Game 1. Still, the smart money is on Andy Pettitte (who struggled on Saturday afternoon, allowing nine hits — but striking out eight — in four innings) starting Game 2, and Phil Hughes (who threw one inning of relief later in that game to earn his eighteenth win) going in Game 3. 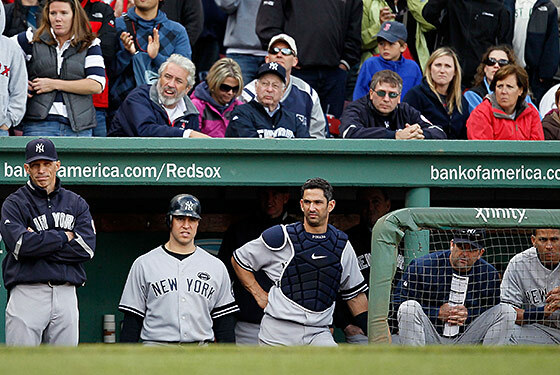 Beyond that, Sabathia could return on short rest in Game 4, the veteran Pettitte would be lined up for Game 5, and A.J. Burnett (who did improve upon his previous outing Saturday night, when he wasn't doing his best Chuck Knoblauch impression), would be kept out of the rotation in the first round.